I’m finally back to finishing this up! Previously on The Four… catch up with episode 45 recap! 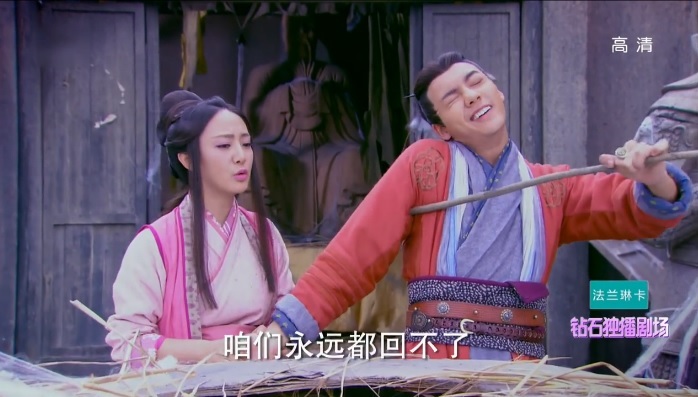 While Leng Xue is curing Li Mo, the hungry Princess finally finds the childlike Zhui Ming in the forest hanging on to two candy covered haw sticks. At first the Princess thought he was just playing with her, but she eventually realizes that he has gone off the deep end 😦 She has no choice but promise to take him to the Princess aka herself. On the way she explains that she came to bring him back to the palace so she can marry him, but now it is seemingly impossible. Just then, two of the women in white show up and offer to bring them to Tie Shou and Wu Qing. As Tie Shou, Wu Qing and Yi Yi happen upon Ming You Shan Zhuang the place where ASG is at while out looking for Zhui Ming. They decide to storm it and ASG releases his legion of zombie-esque women on them. Soon after, Ji Yao Hua also joins the fight, but neither she nor ASG is a match for the power of our heroes combined. Plus, Leng Xue somehow appears as well. Now that he knows he’s losing, ASG invites Leng Xue to Huan Yu Shi Ku (a cave?) to avenge his tribe. Uhhhh ok. Then he brings Ji Yao Hua to another part of the forest and starts to suspect her allegiance. She clearly has changed her mind and now wants ASG dead, but she is able to convince him otherwise. Now that everyone’s reunited, Yi Yi tells the Princess that they have found a cure for Zhui Ming’s ailment. Sure enough, he drinks the meds and suddenly he is all good! 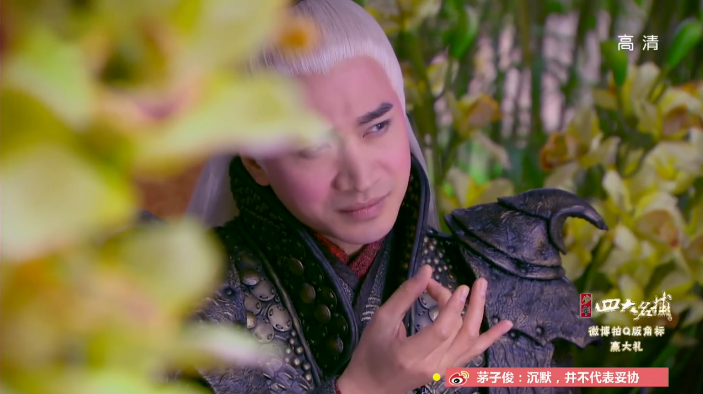 But of course, he is Zhui Ming and he pretends like he’s still ill to trick the Princess into taking care of him a bit more. She figures it out quickly enough and complains to him about all the things she had endured. He explains that he just wanted to get a hug because he loves her! Awwww. Cute! After making sure all the womenfolk will stay home (aside from Li Mo) our heroes set out for Mt. Chao Ge. It’s not easy though as ASG have assigned people along the way, so they decide to split up and meet at the cave. This is exactly what ASG wanted. He plans to let Leng Xue and Li Mo up the mountain, and kill off the rest. Sure enough, Leng Xue and Li Mo as well as the two women in white find the entrance to the cave. Before they can enter, Ji Yao Hua intercepts, telling Leng Xue that he is no competition for ASG. 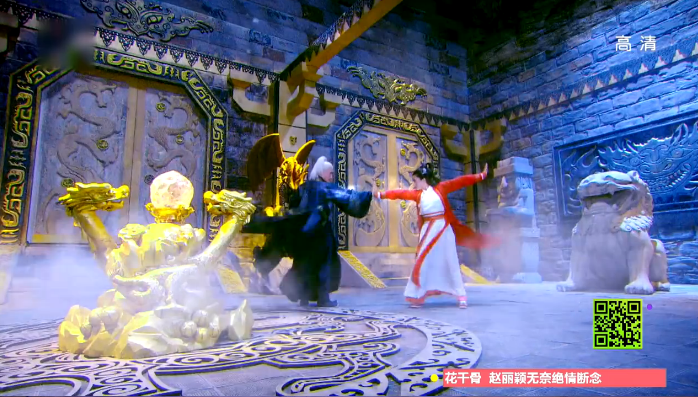 While they are chatting though, Li Mo runs into the cave and Leng Xue follows while the two women in white fight with Ji Yao Hua. Wow, that was a weak attempt Yao Hua. 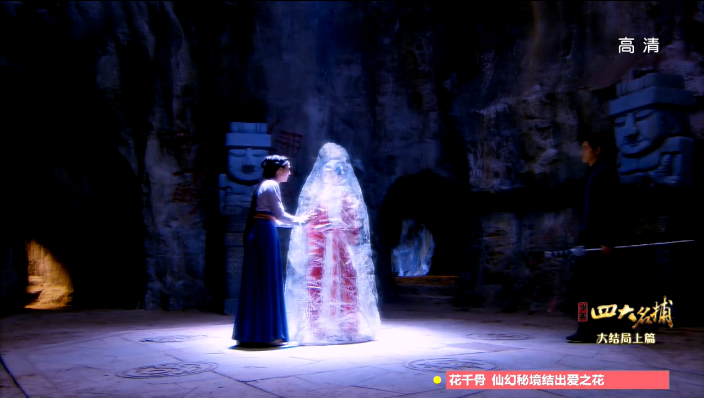 Once inside the cave, Li Mo finds mom enclosed in ice! Mom starts to talk to Li Mo and a tearful reunion ensues. Leng Xue successfully breaks through the ice and saves mom. Horray! Apparently Li Mo’s mom and Leng Xue’s dad were lovers years ago (aren’t they always? ), but because Leng Xue’s dad had to marry someone within the tribe they broke up. Li Mo’s mom then becomes a detective and eventually marries Li Mo’s dad. They led a peaceful life for a while until ASG sent Li Mo’s mom a letter saying she must go to the cave in order to save Leng Xue’s dad. Of course, this was just ASG’s trick. He wanted the blood of both Li Mo’s mom and Leng Xue’s dad in order to open the cave. Since Li Mo’s mom didn’t want to help ASG, he froze her and we all know what happened to Leng Xue’s tribe. As Li Mo’s mom is finishing up the story, who but ASG shows up. Why they didn’t leave first will always be a mystery. He easily defeats them and ties them all up. As he waits for the moon to align with the cave opening he procures blood from both Leng Xue and Li Mo. He pours the blood over the crystal ball and it melts, revealing a keystone for the door. ASG successfully opens the cave and enters to retrieve this fire ball thing and some book with more martial arts secrets. Haven’t had enough? Click for the finale recap! Tie Shou lectures Yi Yi yet again. Argh, seriously. We get it. She did wrong and she can be better. Yes, Yes. Li Mo was able to find the cave because she felt a connection with her mom. Leng Xue stops Li Mo from hitting the ice block with her bare hands because that will “hurt” her mom. But then he goes ahead and use all sorts of martial art moves on it. Uh… and that won’t hurt her?? What?